I’m a firm believer in children learning to swim. It’s just a life skill that all kids should have. 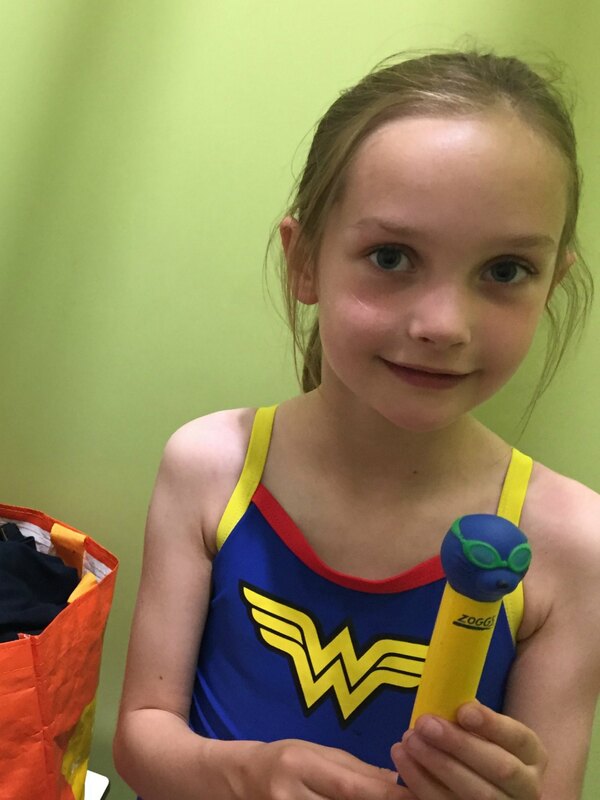 That’s why I’ve always insisted in Little Miss C and Master C attending swimming lessons – even those weeks when it’s cold and seems like more hassle than it’s worth to get there in time. They attend weekly lessons at the local pool and each week put on their coloured hats complete with Zoggs logo on the side. I’ve written before about how my opinions of Zoggs have been changed over the last year – and I certainly no longer look at them as just a logo on a swim hat. The last year has also seem both kids come on in leaps and bounds in the pool. Master C is already up to ASA Stage 3 and LMC spends her half an hour doing lengths of the 25m pool in Stage 6. I’m incredibly proud of both of them, but it has made that half hour of “fun swimming” that we all do together around their lesson a bit more challenging for me. Their confidence levels are such that they want to be all over the place and under the water as much as possible. With my changed (and changing weekly) buoyancy status(!) it’s getting a bit harder to keep up with them. Luckily Zoggs have come to the rescue once more. I’m keen to keep encouraging them in the water – especially when it comes to going underwater. Master C might have bit of a way to go in terms of refining his swimming strokes, but I’m keep to capture the enthusiasm he has right now. I saw another family in the pool using a set of Zoggs Dive Sticks and had one of those lightbulb moments about how perfect they would be for us right now. Thanks to Zoggs the last few weeks I’ve gone to the pool with a bag full of their dive sticks and dive rings and it has totally changed how the kids use that family swimming time we have together. I always like that precious time in the pool together (away from distractions) and they have made it even better. We now spend our time with me coming up with various competitions and challenged for the kids to do with the dive toys. It might be something like “find me a ring and a stick of a matching colour” and then I throw everything into the water in different directions. The kids then love going off to see who can complete the challenge first. There’s a great competitive spirit between them, and all the time they’re also improving their underwater swimming. 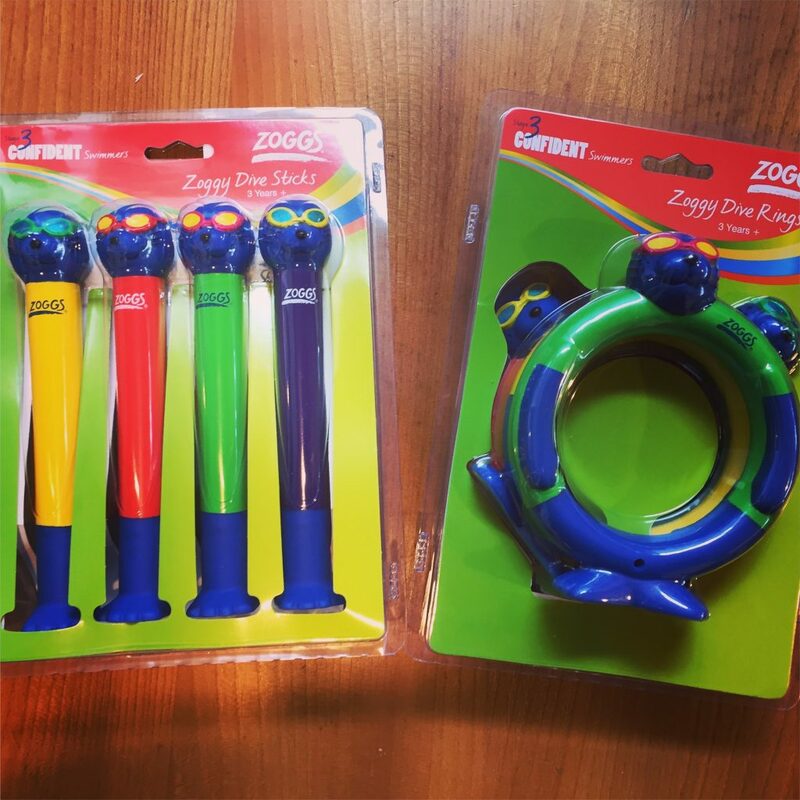 As for the toys themselves – they’re lovely bright colours, very tactile and the quality that you know and expect from Zoggs. For slightly older kids who need a little bit more stimulation and motivation when swimming for fun they’re perfect. Each toy has holes in specific places so that when in the water they fill with it, and then sink to the bottom of the pool. When you take them out the water then pours back out of the holes again. If new swimming toys wasn’t enough LMC has also decided that now that she’s in Stage 6 it’s time for a slightly more grown up swimming costume. 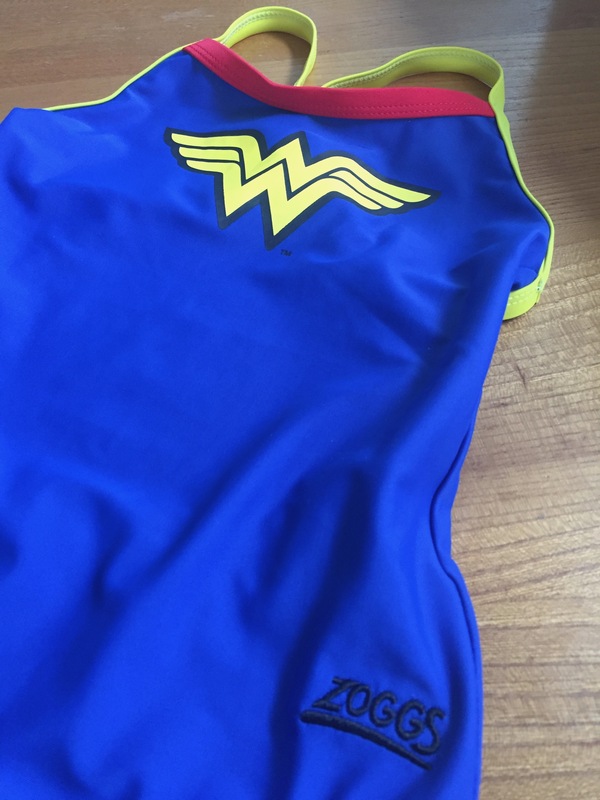 Zoggs to the rescue once again with their amazing Wonder Woman swimming costume. It has to be one of the coolest costumes I’ve ever seen, as well as being perfectly practical for all the swimming that she’s doing. My only complaint is that they haven’t made one yet in maternity sizes! I’m pretty sure everyone in my aquanatal class would have one if they could. Disclaimer: We were sent the Zoggs products featured in this post. All opinions remain my own. This post contains affiliate links.